The modern Indonesian state is founded on the principles of pancasila, which requires the belief in 'one and only God', the practice of either Protestantism, Catholicism, Islam, Buddhism or Hinduism, one of which must be entered on an individual's KTP. Traditional religions are not officially recognised, and accordingly traditional religions are increasingly marginalised, although aspects of the traditional Batak religion are still practised alongside Christianity, and, to a lesser extent, Islam. Creation mythsThere are many different versions in circulation. These were formerly passed down through oral tradition but have now been written down in the local languages. There are also large collections of Batak tales collected by European scholars since the mid-19th century and recorded in European languages, mostly Dutch. "Mula Jadi presents him with all kinds of things to choose from. If the tendi asks for ripe pepper, then the person whom he animates will be a poor fellow; if he asks for flowers, then he will live only a short time; if he asks for a hen, the person will be restless; rags indicate poverty; an old mat, lack of fame; a gold piece, wealth; plate, spear, medicine pot indicate that he will become a great chief or understand magic arts. ""With Mula Jadi in the upper world is a mighty tree called Djambubarus. Mula Jadi has written on all its leaves. On one leaf is written 'many children', on others 'wealth' or 'respect' and so on. 'Contemptible life', 'poverty', 'wretchedness' are also written on the leaves. All the possible different fates of the person are entered on the leaves. Every tendi that wishes to descend to the middle world must first ask Mula Jadi for one of the leaves. Whatever is written on the leaf chosen by him will be his destiny in the middle world. "Among the Karo and the Toba there are sometimes widely diverging versions of where the tendi dwells and how many tendi there are. According to the Toba a person has seven tendi. The second tendi is found in the placenta and amniotic fluid of the new-born baby, and accordingly the afterbirth is given special attention after the birth of a child. 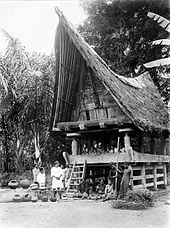 It is usually buried under the house, is called saudara (brother) and is regarded as the person's guardian spirit. Similar ideas about the afterbirth are also found among the Karo, who also bury the placenta and amniotic fluid under the house and regard them as two guardian spirits (kaka and agi) who always remain close to the person. Death cultAt death the tendi leaves the human body through the fontanelle and the "death-soul" (begu) is set free. It is thought that the tendi vanishes and after the death of any human being only the begu continues to exist. The Batak believe that the begu continue to live near their previous dwelling (in a village of the dead which is thought to be situated not far from the cemetery) and that they may contact their descendants. Bad dreams, particular misfortune and such like may be signs that the begu of an ancestor is not satisfied with the behavior of its descendants. Any individual can attempt to pacify an enraged begu by means of food and drink offerings and prayers. If this does not work, a datu or a guru must be called in. The begu are not immortal, since death also rules in the land of the dead: a begu dies seven times before it is changed into a straw and finally becomes earth. Burial traditionsBatak burial traditions are very rich and complex. Immediately after death various ritual actions are performed to make the begu understand that from now on its world is separate from that of its kin. Symbolically this is done by reversing the mat on which the corpse is laid out so that the body lies with its head at the foot of the mat. Thumbs and toes respectively are tied together and the body is rubbed all over with camphor and its orifices stopped with camphor, then it is wrapped in a white cotton cloth. During this perumah begu ceremony a guru sibaso declares to the begu of the deceased that it is definitely dead and must take leave of its relatives. "On the morning of the first day of the festival the graves in the cemetery are opened and the bones of the ancestors that are still there are removed. The unearthing of the skulls is presented as especially moving. The bones are collected in baskets lined with white cloth and then ritually cleaned by the women using the juice of various citrus fruits. The exhumation and cleaning of the bones is accompanied by the singing of laments. The bones are kept in the baskets in the tugu until the next morning, when the remains are wrapped in traditional cloths (ulos) and transferred from the baskets to small wooden coffins. After long speeches and a communal prayer the coffins are nailed down and placed in the chambers of the tugu. A feast consisting of meat and rice follows and traditional dances are performed. "In ancient times these sarcophagi were carved from stone or constructed from wood and later brick. Nowadays they are made of cement or concrete. 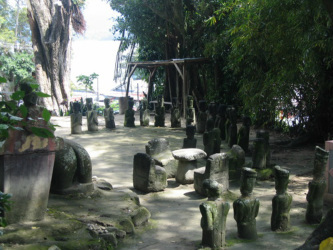 Large and very ornate tugu can be seen around Lake Toba and on the island of Samosir. Batak tugu on the island of Samosir, Lake Toba, December 1984.One motive for the reburial ceremony appears to be to raise the status of the begu of the deceased. 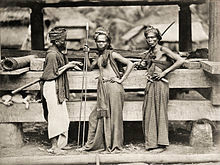 Traditional Batak beliefs hold that the dead occupy a hierarchical status similar to the social position they held in life. This means that a rich and powerful individual remains influential after death, and this status can be elevated if the family holds a reburial ceremony. A rich descendant can advance a begu to the status of a sumangot by means of a great ceremony and a horja feast which can last up to seven days. In antiquity a vast number of pigs, cattle or even buffalo were slaughtered at such festivals, and the gondang orchestra provided an accompaniment. Traditional Batak medicineMadame Sitorus, a well-known Toba guru sibaso who practiced in Laguboti in 1984. She is consulting a paperback edition of the New Testament in lieu of a pustaha. On the shelf are components of herbal remedies. In front of her is a kaffir lime in a bowl of water, a form of divination used to locate lost items or people.In traditional Batak society datuk (animist priests) as well as gurus practiced traditional medicine, although the former were exclusively male. Both professions were attributed with supernatural powers and the ability to predict the future. Treatments and healing rituals bear some resemblance to those practiced by dukuns in other parts of Indonesia. 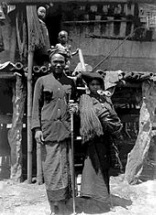 Following the Christianization of the Toba and Karo Batak in the late 19th century, missionaries discouraged traditional healing and divination and they became largely clandestine activities. 1. Protective Magic, which includes diagnosis, therapy, medicinal mixes which have magical properties, such as amulets, parmanisan (love charms), etc.2. Destructive Magic, which encompasses the art of making poison, the art of controlling or utilizing the power of certain spirits, calling the pangulubalang, and the art of making dorma (magical formulas for causing a person to fall in love).3. Divination, which involves oracles (words of the gods), the wishes of the spirits, commands from the gods and from the spirits of the ancestors, and an almanac or calendrical system (porhalaan), and astrology to determine auspicious days and months to accomplish certain actions or goals.The datu or guru consulted the pustaha when presented with a difficult problem, and in time this became in itself a ritual. When missionaries began to discourage traditional healing and augury the Bible may have been adopted by some gurus in place of the pustaha. MalimMain article: ParmalimMalim is the modern form of the Batak Toba religion. Practitioners of Malim are called Parmalim.